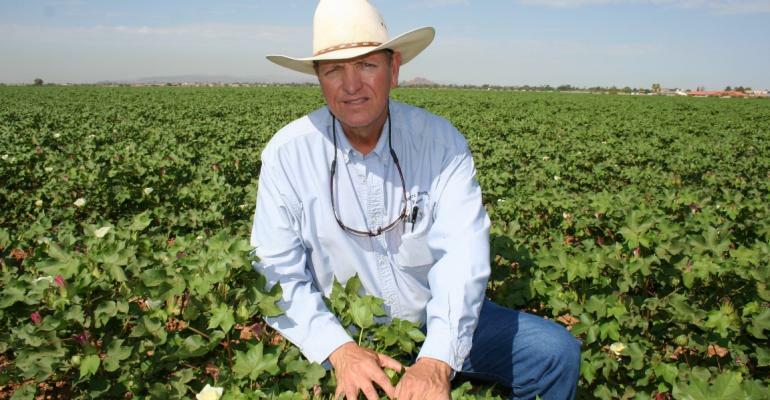 The Arizona Cotton Growers Association (ACGA) has selected fourth generation farmer Kevin Rogers of Mesa, Ariz. as the group’s next executive vice-president. Rogers is expected to take the cotton growers’ administrative helm in mid-April. He will succeed Rick Lavis who held the post for 36 years and succumbed to cancer last fall. The Rogers’ family farms in Laveen and Scottsdale in the greater Phoenix area. Crop rotations include alfalfa, corn silage, cotton, barley, and wheat. ACGA president and cotton grower Paco Ollerton of Casa Grande, Ariz. calls Rogers the “total package” that the 40-member ACGA board was searching for. “Kevin is a real go-getter and brings years of experience and service to the Arizona Cotton Growers,” Ollerton says. Ollerton grows cotton on his Tierra Verde farm in Casa Grande. Rogers has served 15 years as an ACGA vice-president, currently holding the association’s ‘first vice-president’ position. He was recommended for the ACGA’s executive vice-president post by John Maguire, retired chief executive officer of the National Cotton Council (NCC) in Washington, DC. Currently, Rogers is the president of the Arizona Farm Bureau – a post held for 14 years. During his Farm Bureau tenure, Rogers served in numerous American Farm Bureau Federation (AFBF) leadership positions, including as a member of the AFBF board of directors and the group’s executive committee. While an AFBF leader, Rogers also participated in World Trade Organization trade talks held in Geneva, Switzerland. In 2015, Rogers ran for president of the American Farm Bureau Federation (AFBF), a position won by Georgia Farm Bureau President Zippy Duvall. Rogers also served 10-plus years as a member of the U.S. Department of Agriculture’s Air Quality Task Force. According to Ollerton, Rogers will be tasked with dealing with a wide variety of key issues, including the economic survival of the Arizona cotton industry, threatened by lower cotton prices and water supply challenges in the Grand Canyon State. Rogers will represent ACGA with the NCC’s American Cotton Producers organization, the grower arm of the NCC. He will likely provide input into federal farm bill policy deliberations expected to start this fall. “Kevin has the experience with representatives and senators in Washington, DC which is a big plus for all of agriculture,” Ollerton says.